Today I thought it would be fun to marry (pun intended) a couple of our previous themes of the week -- volcanos and 6-7-08 weddings. Like Taryn and Jessica, Kerry was also one of our 6-7-08 brides. 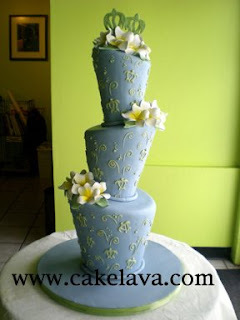 For Kerry's wedding, her colors were periwinkle blue and a soft sage green and she fell in love with the tall unusual shaped white swirl/plumeria wedding cake on cakelava.com, a design previously featured on our blog back in June called "A Glimpse After the Cake" . She wanted the same shape with the handcrafted plumerias but wished to include a honu motif. Honu is a Hawaiian sea turtle, which many believe bring good luck. I know we do, especially when Rick and I are swimming at Kailua beach and they come up to us. It's magical! In Hawaii the Honu is often represented by a petroglyph design of a turtle, and for a wedding with a Hawaiian motif the honu is common to find on invitations. 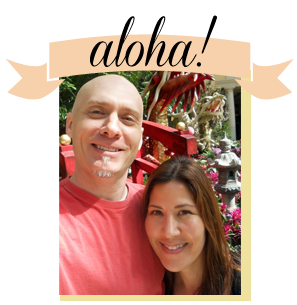 We thought the plumeria flower worked well with the honu/ocean motif that Rick used on the cake. Kerry surprised her fiance with his own sculpted Groom's cake, representing both Hawaii and Newfoundland, where he was from. 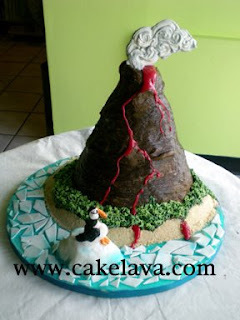 She thought it would be fun to do a volcano, with a puffin, commonly found in Newfoundland, and have the puffin sit on an iceberg. 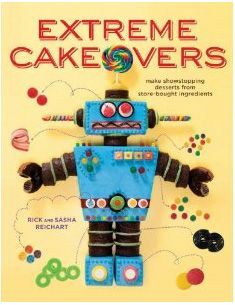 Well, it's cake and fantasy is allowed. The result is shown above. Kerry put as much importance on the taste of the cake as the look and she carefully chose her flavors of Lemon Pucker and Local Kine Special for the wedding cake and our Chai Latte flavor for her volcano/puffin cake. You could say their wedding was a HOT, cool, and spicy affair.